Marker Location: 421 E. Queen Isabella Blvd. Built of brick brought from New Orleans by schooner. 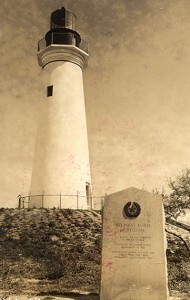 The beacon’s 16 mile range guided ships into the harbor and to the Rio Grande, bringing commerce to sw Texas. Darkened during the Civil War, it was used as a lookout by both Union and Confederate forces, and again during World War I. 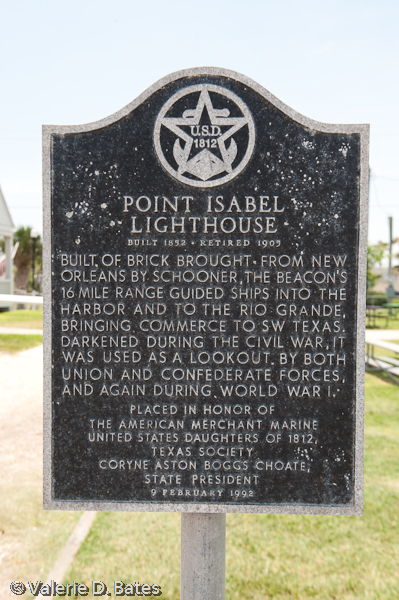 Placed in Honor of the American Merchant Marine United States Daughters of 1812, Texas Society Coryne Aston Boggs Choate, State President. 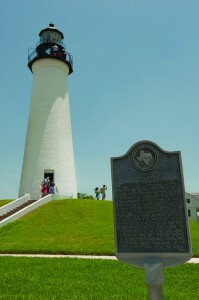 The Point Isabel Lighthouse is one of the oldest functioning lighthouses on the Texas Gulf Coast. 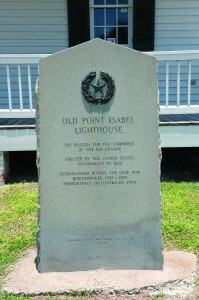 It played a significant part in military operations around the mouth of the Rio Grande during the Civil War and for over a century, with some interruptions, has served the region as an aid to seamen.